NASHVILLE, Tenn. (February 4, 2016) – Richard Young of The Kentucky Headhunters has a fear of flying, but this time, that won’t be stopping him. The GRAMMY/CMA/ACM winning southern rock group will get a little closer to the “Spirit In The Sky” as the stars have finally lined up for the Heads to jet-set Europe for main stage performances at both the Sweden Rock Festival June 9 in Solvesborg, Sweden, and the Ramblin’ Man Fair July 24 in Maidstone, Kent, UK. Headlining the Sweden Rock Festival are Queen + Adam Lambert, Twisted Sister, Foreigner; and at the top of the bill for the Ramblin’ Man Fair are Whitesnake and Black Stone Cherry. Although the Headhunters perform nearly 100 dates per year across the U.S. and Canada, their conventional way of getting to and from has always been their tour bus. Hundreds of thousands of miles have passed underneath those wheels since the late 80s. Richard Young preferred them planted firmly on the ground. Young credits his friend Martin at the Fresh Start Agency in Europe and his son John Fred for landing these great opportunities for the Headhunters. The band will perform their own set on the festivals’ main stages, but also hopes to jam with ‘kin-folk’ Kentucky rockers Black Stone Cherry at Ramblin’ Man Fair. Black Stone Cherry is racking up rave reviews on their second headlining arena tour in the UK. The drummer of the band, John Fred Young, is Richard’s son and also the nephew of The Kentucky Headhunter’s drummer, Fred Young. “It’s really gonna be cool for The Heads and BSC to play on the same stage in the UK. Both bands are two generations of family based out of the same town, Edmonton, Kentucky,” said Richard Young. 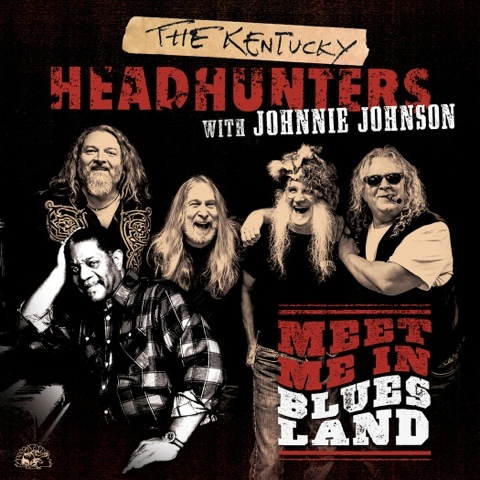 The Kentucky Headhunters are fresh off of the 2015 release of their new blues album Meet Me In Bluesland, (released by Alligator Records), featuring the pianist Rolling Stone called “the greatest sideman in rock and roll” – Johnnie Johnson. The album received rave reviews from outlets like No Depression which writes, “Age has only improved this offering, rockin’ Appalachia-billy that’ll put a big ole grin on your face,” and Blues Blast Magazine which adds, “The beautiful piano work and synergy between Johnson and the Headhunters is something that should not be missed. It is a raucous and wonderful album.” The project was also named No. 12 on the list of the most-played albums of 2015 published by Living Blues Magazine. UK-based The Blues Magazine gave Meet Me In Bluesland a slot in the Top 50 essential rock and blues albums of the year. Feb. 13 Veterans Appreciation, Black Diamond Harley Davidson | Marion, Ill.
March 11 Hoosier Park Casino | Anderson, Ind. March 12 Indiana Grand Casino | Shelbyville, Ind. March 17 Akwesasne Mohawk Casino | Hogansburg, N.Y.
March 25 Capitol Theatre | Lebanon, Tenn.
April 1 Smoke On The Water Festival | Thomaston, Ga.
April 28 Spring Motorcycle Rally Concert | Panama City Beach, Fla.
April 29 The Ranch Concert Hall & Saloon | Fort Myers, Fla.
April 30 The Orange Blossom Opry | Weirsdale, Fla.
May 1 Auburndale Speedway | Winter Haven, Fla.
May 7 Love Valley Arena | Statesville, N.C.
May 27 Bratfest – Willow Island | Madison, Wis.
Aug 13 Operation Restoring Hope Music Festival | Goodland, Ind. Stay up-to-date on all happenings on the road with The Kentucky Headhunters by following updates on their official websitewww.kentuckyheadhunters.com and on Facebook and Twitter!